Interest rates around the world. And you think that interest rates are low here? You should be Japanese. The Japanese people are paying the Japanese government to buy government bonds. The rate on 10 year bonds is minus 0.159%. Lenders are willing to pay the Japanese government for the privilege of getting back their principal, ten years from now. Things are just slightly better in Germany. The German government bond is yielding 0.025%. That means if you lend the German government $1000 today they will give you back $1002.50 in ten years. UPDATE: June 14th, the morning the rate on the German bond has dropped to zero. Would You Make a 0% Interest Loan? Did you know that the U.S. Treasury has sold $1 trillion (yes, trillion with a T) dollars worth of Treasury bills that pay no interest? Why would anyone lend out his or her money without charging interest? One answer might be because the alternatives seem worse. In fact, for a brief moment in 2008 investors were willing to earn negative interest and actually pay for a U.S. Government guarantee to get back less than they put in! To understand the alternatives you have to realize that the people who do this are not mom and pop investors. They are the huge players who round to the nearest million and deal in billions of dollars. They don’t have the option of putting their money under the mattress. These people don’t deal in physical dollars, so when they raise cash it has to go somewhere else. Not doing something with their money is not an option. When both stocks and bonds are going down, the only relatively safe haven is the U.S. Treasury market, and the safest part of that market is short-term Treasury notes. When there is not a big enough supply of notes but you need to buy anyway, you accept a negative interest rate. Of course, individual investors have been willing to leave their “safe” money in money market accounts paying virtually zero percent for several years now. That’s a rational decision since literally putting your money under your mattress or burying it in the back yard leaves you vulnerable to thieves and robbers. But it may make the smaller investor feel better that the “big boys” with their billions are sometimes worse off than the retail investor when it comes to finding a safe haven. A Client Asks: What’s the Benefit of Inflation? One of our retired clients sent us a question recently. I suspect that there are a lot of people who feel the same way. It’s a good question. Who wants ever rising prices? Here’s how I addressed his question. Rising prices reflect a growing economy. Prices typically rise for one of two reasons: Either there’s a sudden shortage of supply, or demand goes up. Supply shocks—like a disruption in the flow of oil from Libya—are usually bad news, because prices rise with no corresponding increase in economic activity. That’s like a tax that takes money out of people’s pockets without providing any benefit in return. But when prices rise because demand increases, that means consumers are spending more money, economic activity is picking up, and hiring is likely to increase. A case can be made that in a dynamic economy you can never get perfect stability (e.g. perfectly stable prices) so it’s better for there to be more demand than supply – driving prices up – rather than less demand than supply – causing prices to fall (deflation). Of course we have to realize that “prices” here includes the price of labor as well as goods and services. That’s why people can command raises in a growing economy – because employers have to bid for a limited supply of labor. On the other hand wages are stagnant or even decline when there are more people than jobs. But for retirees on a fixed income inflation is mostly a negative. Your pension is fixed. Social Security is indexed for inflation but those official inflation numbers don’t take food and fuel costs into consideration and those have been going up faster than the “official” rate. The stock market also benefits from modest inflation. Which gets us to the Federal Reserve which has kept interest rates near zero for quite a while. It’s doing this to encourage business borrowing which is supposed to lead to economic expansion but the actual effect has been muted. That’s because other government policies have not been helpful to private enterprise. In effect you have seen the results of two government policies in conflict. It’s really a testimony to the resilience of private industry that the economy is doing as well as it is. The effect on conservative investors (the ones who prefer CDs or government bonds to stocks) has been bad. It’s absolutely true that after inflation and taxes the saver is losing purchasing power in today’s interest rate environment. The FED is not doing this to hurt conservative investors but that’s been the effect. The artificially low rates will not last forever and the Fed has indicated they want to raise rates. They key question is when, and by how much. This is done over the long-term on a regular basis if you are disciplined and adhere to an asset allocation strategy. Assume that your ideal portfolio is 50% stocks and 50% bonds. If stocks have a good run and the stock portion grows to 60% and bonds are now 40% you sell some of the stocks that have given you a nice profit and bring the portfolio back into the 50/50 balance. Suppose the opposite happens: the stock market declines and the portfolio now consists of 40% stocks and 60% bonds. Now you sell some of the bonds to buy more cheap stocks, bringing the balance back to 50/50. In this way it’s possible that you can make a fair return on your portfolio even if – over the long term – neither the stock or bond market actually rises but simply fluctuates. Interested in a disciplined approach to investing? Are you flunking the retirement readiness test? That’s the situation many people are finding themselves in today. Once upon a time, employers set up pension plans managed by investment professionals. You worked and when you retired the pension checks began coming for the rest of your life. That ended when 401(k) plans began replacing defined benefit pension plans. Once, employers made the contributions, investment pros handled the investments and the income part was simple: You retired, the checks started arriving and continued until you died. Now, you decide how much to invest, where to invest it and how to draw it down. In other words, you fuel the plane, you pilot the plane and you land it. It’s no surprise that many people, especially middle- and lower-income households, crash. The Federal Reserve’s latest Survey of Consumer Finances, released in September, found that ownership of retirement plans has fallen sharply in recent years, and that low-income households have almost no savings. But it’s not only the low-income workers who lack basic financial wisdom. Eighty percent of Americans with nest eggs of at least $100,000 got an “F” on a test about managing retirement savings put together recently by the American College of Financial Services. The college, which trains financial planners, asked over 1,000 60- to 75-year-olds about topics like safe retirement withdrawal rates, investment and longevity risk. Seven in 10 had never heard of the “4 percent rule,” which holds that you can safely withdraw that amount annually in retirement. Very few understood the risk of investing in bonds. Only 39 percent knew that a bond’s value falls when interest rates rise – a key risk for bondholders in this ultra-low-rate environment. If you fall into this category and want to find out what help is available, contact us. We’ll be glad to chat; no sales pitch and no pressure. At one time, living on a fixed income meant you were retired, received a pension and social security, and got some extra income from your savings. For our parents and grandparents, certificates of deposit, otherwise known as “CDs” were a guaranteed source of no-risk income. Back in 1981 you could put your savings in the bank and get nearly 18%. That was a period of high inflation when prices were also going up. But CDs and bonds paid investors high enough rates so that retirees were comfortable with putting their money into CDs or bonds. But interest rates have been on a downward path since then. 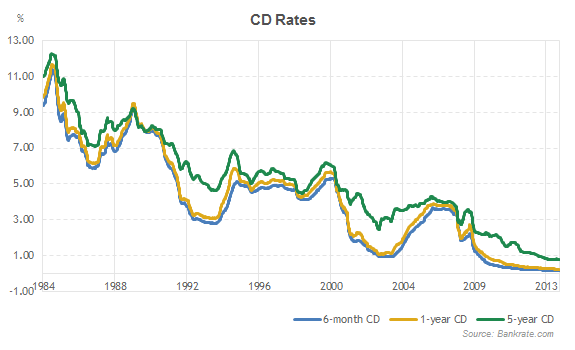 CD rates have dropped from about 11% in 1984 to 1% or less today. Today, CDs and bonds, once the go-to choice of the thrifty retiree, pay a small fraction of what they once did, and provide very little income to supplement their other retirement income sources. The Federal Reserve has been keeping rates close to zero for years to try to jump-start the economy, with limited success. But while it’s been good for businesses and home buyers who have have been able to borrow money at rates that we have not seen since the 1950s, the traditional saver has seen their income dry up, collateral damage of Federal Reserve policy. U.S. households lost billions in interest income during the Fed’s near-zero interest rate experiment. Because they are often reliant on income from savings, seniors were hit the hardest. Households headed by seniors 65-74 years old lost on average $1,900 in annual income over the past six years, according to a November 2013 McKinsey Global Institute report. For households headed by seniors 75 and older, the loss was $2,700 annually. With a median income for senior households in the U.S. of roughly $25,000, these are significant losses. In total, according to my company’s calculations, approximately $58 billion in annual income has been lost by America’s seniors since 2008. Retirees depend on income from their savings for basic living expenses. Without that income, many seniors have taken on greater risk to increase the potential yield on their savings, or simply spent down their nest eggs. After decades of playing by the rules, putting off spending and socking away money, seniors have taken it on the chin. This strikes a blow at the core American principles of self-reliance, individual responsibility and fairness. What’s a retiree to do? Let’s look at some of the alternatives that people on fixed incomes are being offered and what to watch out for. All of them involve risk that may not be readily apparent. There are traps for the unwary. Bank of America said that 45% of all government bonds worldwide yield less than 1%. Central bankers from around the world meet today to find a way of spurring economic growth. Most have adopted a low interest rate strategy. That’s good for stocks, but it’s devastating for savers who are making less than zero once inflation and taxes are factored in. Speculation that the European Central Bank will start buying debt in the year ahead pushed German 10-year yields to a record low of 0.866 percent last week. The rally helped drive demand for Treasuries and other notes as investors sought higher interest payments than they can get in Europe. Bond investing in today’s ultra-low rate environment has many investors frustrated and many professionals worried. Why? Because once interest rates start going up, the value of existing bonds goes down. Dan Fuss, known as the Warren Buffett of bonds, said his $23 billion Loomis Sayles Bond Fund is sitting on more than 20 percent of cash and cash equivalents, its highest level ever, because he sees scant opportunities in the bond market. “If we saw a lot of value, we wouldn’t have those reserves,” Fuss told Reuters in an interview. Fuss, vice chairman and portfolio manager at Loomis Sayles, which oversaw $199.8 billion as of December 31, said the Loomis Sayles Bond portfolio has been building cash since early 2013 and has boosted levels as fixed-income securities have become increasingly pricey. Despite his high cash position, the fund has done very well. In 2014, the Loomis Sayles Bond Fund has posted a return of 3.42 percent, outperforming 85 percent of its peers, according to Morningstar data. Over the past 10 years, on an annualized basis it has returned 8.37 percent, surpassing 94 percent of its peers for the same period, according to Morningstar data. For its five-year record, the Loomis Sayles Bond Fund has posted returns of 14.61 percent, ahead of 85 percent of its peers. Municipal bonds are found in the portfolios of many higher income investors. They have experienced great returns over the last 30 years. Part of that has come from interest payments and part has come from bonds price appreciation. Remember, falling interest rates (and we have seen interest rates fall since 1980) leads to higher bond prices. The problem for bond investors is that rising interest rates have the opposite effect: bonds go down in price when rates go up. And today’s low rates are largely being engineered by Federal Reserve policy of low, low rates to spur a slow-growth economy with high unemployment. When the Fed stops easing, we can expect rates to rise, and perhaps rise rapidly. Investors in the $3.7 trillion municipal market will probably face negative returns in 2014 following declines this year, the first back-to-back annual losses since at least the 1980s, according to Morgan Stanley. The company’s base-case scenario for city and state debt in 2014 calls for a loss of 1.7 percent to 4.1 percent, Michael Zezas, the bank’s chief muni strategist, said in a report released today. A year ago, he correctly predicted that munis would lose money in 2013 as yields rose from the lowest since the 1960s. In addition, we have seen a rash of municipal bankruptcies which causes investors to be concerned about getting their money bank if a city defaults on its obligations as Detroit is set to do. For investors who have accumulated large municipal bond positions either as individual bonds or as bond mutual funds, caution is the watchword. While interest rates on bonds have risen slightly from the absolute bottoms, investors looking for income are still not satisfied with the rates that they can get today. Adding to their concerns is the expectation that when the federal reserve slows “quantitive easing” interest rates will rise to significantly higher levels. And that means that the bond they buy today will probably go down in value. As a result, income investors are actually looking at dividend paying stocks to provide the cash flow that they need. One other advantage of this strategy is that many companies have been raising their dividends regularly, something that bonds don’t do. Scary Headlines and bad advice.